We strive to purchase high-quality products from select manufacturers and distributors that adhere to quality standards, and quality processes (such as ISO 14001 certification). The return rate of our cables is extremely low (approx 0.05%). We take defects seriously and track the rate of return of ALL our products, and work directly with manufacturers to make sure any problems found are immediately corrected. Sales and Returns (RMA) Unlike other E-commerce sites, all sales are NOT final. You may return an order (the entire order, or specific products from an order) with 30 days from the invoice date for a full refund LESS your shipping costs with no questions asked. There will be no additional handling charges, or return charges. All products must be in their original packaging and be otherwise "complete" and undamaged. Products returned without their originally packaging MAY be assessed a return charge if such lack of packaging deems the product un-sellable. You MUST obtain an RMA number prior to shipping any product back to us. We will not accept product back for refund (or credit) after 30 days, except if the product needs servicing (such as warranty) as described below. OPENED products - including cables, TV mounts, electronic hardware will be assessed a 10% re-stocking fee - no exceptions. If you are returning a product that is in its original packaging, including the original sealed poly bag (for most of our bulk cables), you will NOT be assessed a re-stocking fee. My Cable Mart LLC has a generous return policy for products purchased within 30 days for refund. In addition, we offer a special 30 day defective product policy, and a "beyond" 30 day defective product policy. These return policies can be found in detail here. UPS is our PREFERRED shipping method for all our shipping. We can only ship to PO Box offices using USPS Otherwise, we must have a physical "ship-to" address. Our packages use "Proof of Delivery" as provided by the USPS. Our shipping rates charged are the actual shipping rates charged by USPS with no special "mark-ups" or handling fees. 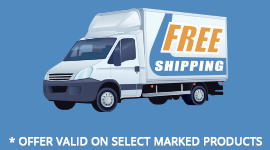 For more details on suggested shipping methods, estimated delivery times, and rates, click here. Orders placed BEFORE 4:00pm CST generally will ship the same day they are received. Our USPS pickup time is approximately 3:50pm Monday-Friday. In additional USPS Express Mail pickups are done at approximately 10:00am each morning. Orders normally placed AFTER 4:00pm CST will be shipped out the next morning. We strive to stock 100% of our listed products, and very rarely have to hold up an order due to a stock shortage. You WILL be immediately notified if your order is subject to a back-ordered item. Upon completion of your order on our website, and once confirmed, your credit card is charged. Your product will be shipped on the same or next business day. Should we find that we can not completely fulfill your order, we make elect to partially ship your order, and back-order any products that are not stocked. You will be immediately notified of any products that can not be immediately shipped. If your credit card is declined for any reason at the time of placing the order, we will not process the order. We do not impose any surcharges to your credit card, or your PayPal account. We use Authorize.Net (via Wells Fargo Bank) to process all our credit card transactions. All credit card transaction require that you supply us a valid billing address - and that this address exactly match your credit card's billing address. We impose strictly fraud protection measures, and report all incidents of attempted credit card fraud directly to Authorize.Net. When a refund is needed due to an order cancelation that occurs on the SAME DAY as the authorization, we will attempt to VOID such authorization. Please allow up to 5 business days for such VOID to release funds to your credit or debit card. Refunds AFTER the credit or debit charge has been settled will be made using a separate transaction. Such refunds should be visible immediately (if viewing on-line) as a PENDING transaction, and will settle on the next banking day. ALL transactions are conducted in US DOLLARS. As such, if your credit or debit card uses a different currency, there may be currency conversation fees or currency exchange rate differences (as imposed or determined by your bank) that will NOT be refunded or credited by My Cable Mart. This privacy statement covers the site http://www.www.mycablemart.com and the legal business My Cable Mart LLC operating as an S-Corporation in the state of Minnesota. Our complete contact information can be found here. My Cable Mart LLC values our customers and their privacy. Personal information obtained during an order fulfillment process - such as name, address, phone number, email address, and source IP address - is used to properly process and obtain payment for your order. In addition, we have partners (disclosed below) that also use some of this information to assist in the processing, fraud checks, and payments of such orders. Periodically, but NEVER more than once per quarter, My Cable Mart may contact you by email, or mail with a marketing opportunity specifically relating to the products that are sold on our website. Such emails are fully compliant with US anti-spam laws offering our customers a "one-click" opt-out option to permanently remove your email address from our marketing database. We may also contact you by email, phone, or mail if we need to follow-up with a specific order, a warranty issue, or a product recall if legally required. My Cable Mart makes use of "cookies" to assist in the shopping experience. Cookies are NEVER placed on your computer other than for this specific need of keeping tracking of items added to your shopping cart. Once your order has completed, these cookies are removed from your browser cache. We engage in business partner McAfee to perform security scans daily on our order processing server to make sure your order information (including credit card) is securely processed. Actual payment information is not ever stored on our servers - only transaction authorization numbers. In order to retrieve your credit card information, we must directly access the Wells Fargo Merchant Center. In addition, as required by our credit card processor, we record, and permanently store your computer's IP address. This data is used as a small part of our general security process. Disclosure of Personal Information My Cable Mart does not share, provide, sell, or otherwise provide any of your personal information that you have provided to us to ANY company, except for the sole purpose of fulfulling your order. We have entrusted and reviewed our partner's Privacy Statements to ensure that none of your information is shared outside of their business units.